By now, you've probably heard the one about a new El Camino coming to the US from GM's Holden division in Australia. If you haven't, here it is in a nutshell. Holden execs just confirmed the company's fastracking the Holden VE Ute — that's the pickup version of the VE Commodore (aka Pontiac G8). Word is Holden must increase production numbers to maximize efficiencies (that's bizspeak for lowering per-unit cost) at its Elizabeth plant. While a previous report indicated the extra cars would be primarily for South America, the latest gossip points to a new GMC car-pickup for the US. Why not a new Chevrolet El Camino? Australia's Carpoint says it's because the GTO debacle soured GM on reaching for another iconic badge. Still, in light of Ford's rationale for revisiting the Taurus name (i.e., mass recognition), we can't fathom GM selling a new car-pickup as anything but a Chevrolet El Camino. They'd have to be nuts to leave that big enchilada hanging in the room. Just food for thought. 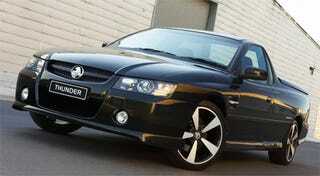 Say It&apos;s So, Mate: Holden Ute Coming Stateside?